A request to fund the conservation of two historic, beautifully diverse and undeveloped properties are on the warrant at this Saturday’s Town Meeting. 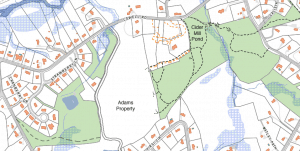 Secure a permanent Conservation Restriction for 45 acres of the existing Salt Box Farm property at 1 Wright Lane along Hildreth Street. 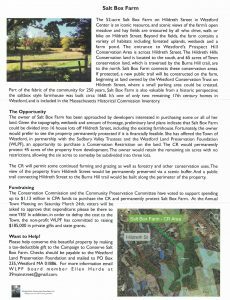 The trust urges you to support the preservation of these very important properties, which will contribute to maintaining open space critical to the natural character of Westford. Please attend Town Meeting and vote to support the protection of these two properties as part of the CPA funding request on Article 13. The Board of Directors for the Trust has voted unanimously to support both these CPA funding requests.